Why Are COPD and Anxiety Connected? A chronic obstructive pulmonary disease (COPD) diagnosis carries a lot of weight. The diagnosis is frightening as you begin to image the ways your life will be limited. You spend more time thinking about the restrictions and losses rather than the positive things you gain. COPD does provide something new, though: anxiety. It has been estimated that people with COPD are up to 10 times more likely to suffer from panic attacks than those without COPD. During a panic attack you may feel heart palpitations, trembling, chest pains, dizziness, chills and fear of dying. Other symptoms include shortness of breath and feelings of choking. 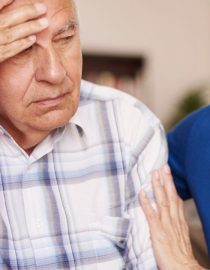 COPD and dizziness, chest pains, shortness of breath and choking typically go hand-in-hand anyway, so differentiating them as symptoms of anxiety can be difficult. Anxiety and panic attacks are mental conditions. However, their symptoms manifest in very physical ways – and they are often exacerbated due to a physical condition – COPD. Thoughts, feelings, emotions, behaviors and physical sensations can trigger anxiety and panic. As mentioned, anxiety increases if your body misinterprets COPD symptoms for anxiety. Learning to identify symptoms of COPD and differentiating them from anxiety accurately is helpful. What does anxiety feel like? What does panic feel like? What does COPD feel like? Consider the differences and make lists to clarify them. Pay more attention to your body and your mind. What are you thinking? What does your body feel like? Noticing changes and new sensations while they are mild gives you more power to react and reduce your symptoms. If left to build, your thoughts can become more negative and anxious. Anxiety works by making you think something terrible is going to happen. After a panic attack, people report thinking they were having a heart attack, a stroke or they were going to stop breathing. Anxiety is scary, but anxiety is only anxiety. Remind yourself that COPD is creating these new sensations and experiences. If you can treat the symptoms of COPD early, your mind will not have time to misperceive them. If exacerbations occur, follow your doctors prescribed treatment as soon as possible. The longer you experience the symptoms, the harder anxiety will try to convince you of danger. You might also like...What Causes COPD? COPD is stressful enough without the added pressures of anxiety. Everyone can benefit from finding new sources of relaxation. Yoga, breathing exercises, guided imagery and autogenics yield high benefits when done consistently. You can also engage in more pleasurable activities like visiting with friends, getting a massage, or going out for dinner and a movie. Discussing your feelings and experiences with trusted people in your life will improve your experience. Seek out advice from people with expertise on the subject. What do they recommend? You may also want to consider seeing a therapist. It is well documented that therapy combined with prescription medications is more effective at treating anxiety than drugs alone. Cognitive behavior therapy (CBT) has been found to decrease breathing problems, as well as symptoms of anxiety and depression. It is estimated that the prevalence of depression in patients with COPD ranges anywhere from 7 percent to 80 percent. Just as anxiety must be treated, so must depression – and it is equally, if not more important, to discuss depression symptoms with your physician. Seeking treatment for depression and anxiety can improve the prognosis of COPD.